I rarely go to 50% off days at thrift stores anymore. The crowds are not worth the hassle. On Memorial Day, I threw caution to the win and decided to check out the sale at Park Ave Thrift. Not only did I score some major finds but the store wasn't super crowded either! 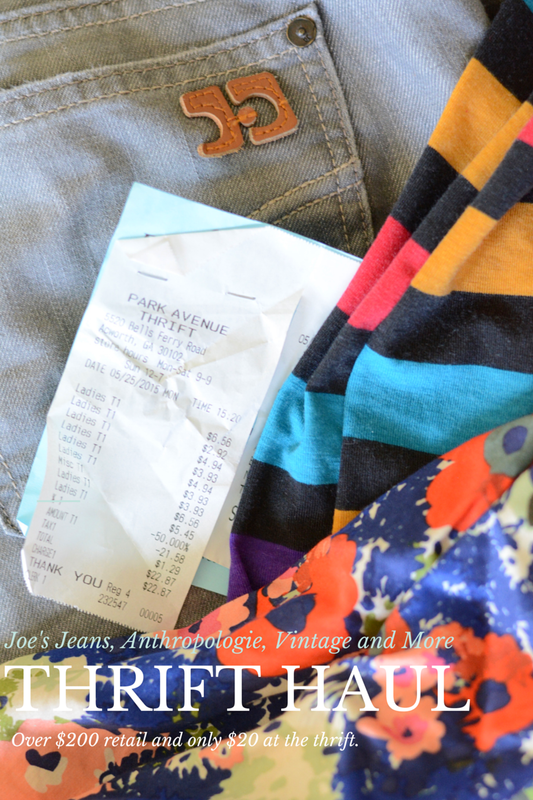 My total price was $22 and I found vintage sequins, Joe's Jeans, and more! I'm under my thrift store $3/item budget and my haul has a retail value over $200. Let us review. 1) A humongous scarf. I've never come across a really big scarves good for head wraps. I normally use fabric from my stash. 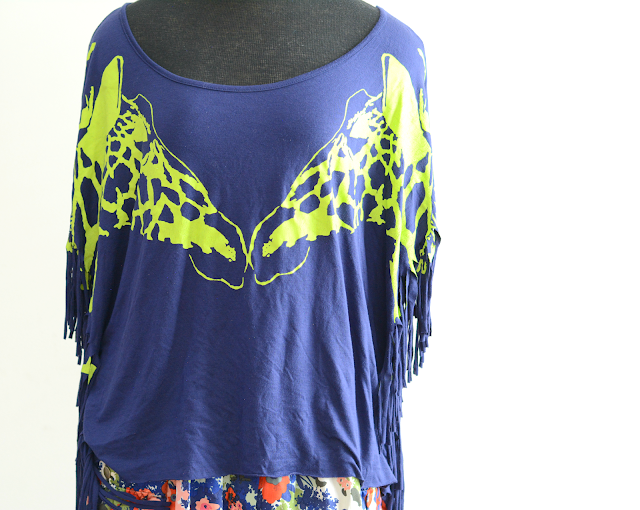 I was able to make this one into a kimono too by tying the ends together. I love the duo functionality. 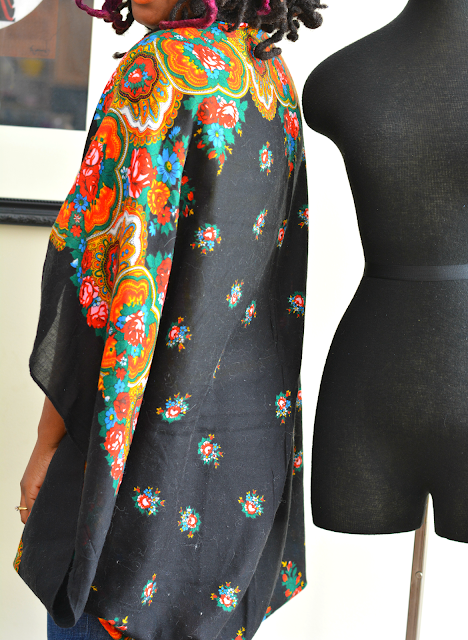 2) Vintage sequins. You probably thought I completed my sequins phase. Nope. Still love. 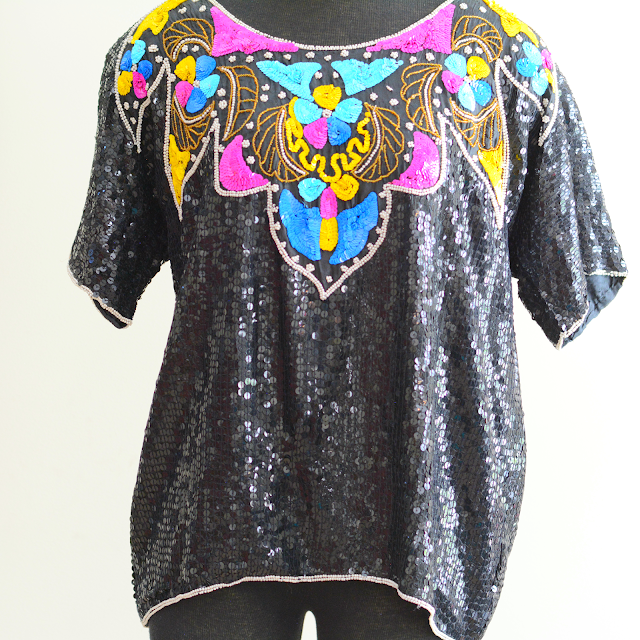 The colored sequins on this one was definitely a keeper. 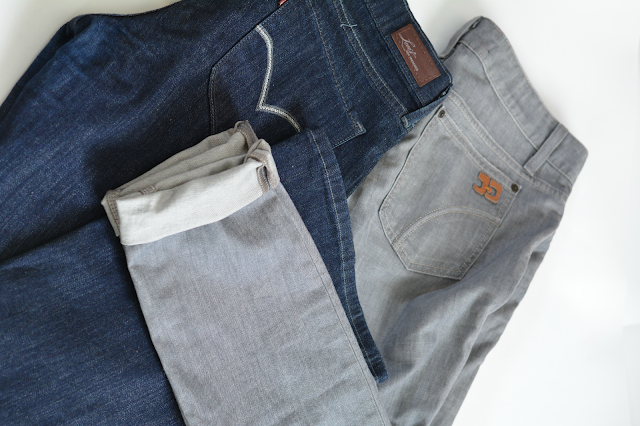 3 & 4) Two pairs of jeans. I went down the jeans aisle in search of gray jeans. They've been on my wishlist and it was here that the thrift gods smiled upon me and led me to New. Joe's. Grey. Jeans. In my size! Retail price is $165 and only $3 thrifted. While going through the aisle I also found new Levi's demi curve and they work well with my curves! 5 & 6) Two Dresses. 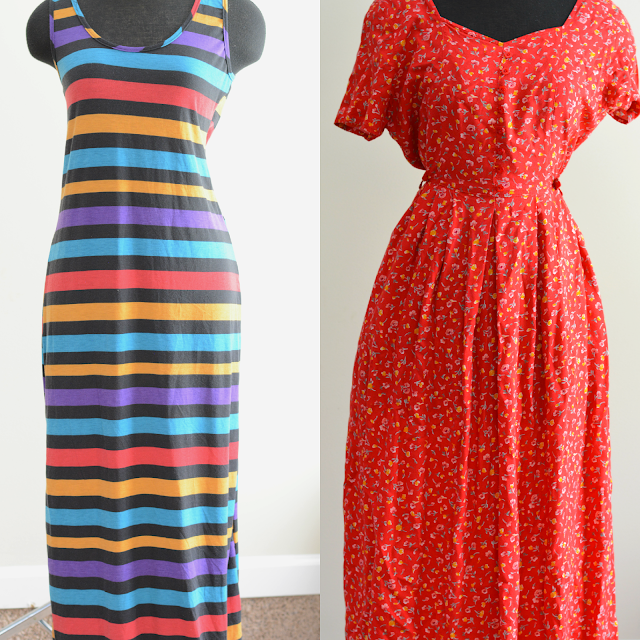 The dress on the left is summertime easy dressing with lots of color. The one on the right is for refashion purposes. I liked the neckline and waist on them. We'll see what happens. 7) Ocasion t-shirt. I wasn't too sure about this t-shirt until I tried it on. 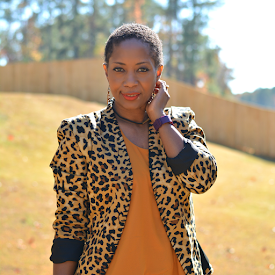 It boho chic and doesn't really define my style. Does it? I don't know. Who cares. I liked the color combination of neon green and blue. When I tried it on, I loved how it looked on me. 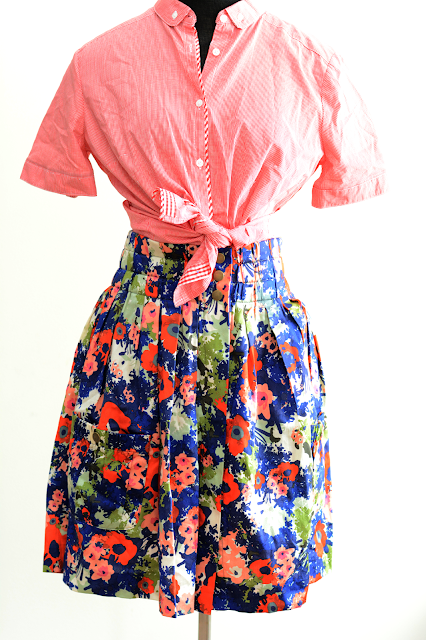 8 & 9) Gingham button up and Parameter apothecary skirt. I'm tried to add more red to my closet and a simple gingham button up felt like a good classic piece to have. I like the high waist and front snap closure on the skirt and it made my final cut after I tried it on. It retailed $98 at Anthropologie. Wow! It's a few years since I took a trip to the USA and these amazing prices make me want to head back asap, even the cheapest charity/thrift shops over here in the UK don't come close. Great haul! You find the most amazing clothing in your thrift stores, Troy! I love your finds and your budget goal! Those gray joe's jeans are fabulous!! Great haul! I'm loving the gingham shirt and skirt combination! What lovely gems you've found! You definitely scored!